The popularity of outdoor spaces is increasing exponentially. At Home Technology Experts, we work closely with clients, builders, and landscapers to transform backyards into comfortable and functional spaces. The integration of exterior technology into home automation systems is identical to that of interior technology. Just like the construction of a home, the sooner HTE is brought in, the better we can incorporate technology resulting in a cohesive design. Home Technology Experts has been installing outdoor systems since our inception in 2004. Each advancement in exterior technology and new outdoor product create additional design options. At this point, all interior luxuries have an exterior counterpart, and HTE can integrate them into your automation system for easy control. If it runs on electricity we can integrate it with your Control4 or Savant home automation system. If you have an electronic external product rated for outdoor use, we will integrate it for you. Please include what systems (audio, video, lighting, etc.) you are interested in and when you plan to start construction. Watch the news while sipping your morning coffee, cheer on your favorite sports team while floating in the pool, or enjoy a movie as you lounge under the stars. Outdoor television and theaters allow you to enjoy any video source (cable, streaming, Kaleidescape, DVD, etc.) while you enjoy the beautiful summer weather. In our blog article, Do I Really Need An Outdoor TV, HTE addresses the necessity of using products that are designed and rated for outdoor use. Improperly using electronics can cause product damage, void warranties, and can put the safety of your family and property at risk. While all outdoor televisions are brighter than a typical display, the Seura Storm is the only TV designed to be placed in direct sunlight. Outdoor theaters are essentially exterior home cinemas. Our system designers ensure that the projector resides at the right height on the correct angle to properly fill the “screen” area. Some outdoor theaters use descending screens, some use ascending screens, others use structures such as retaining walls. In our blog article, The Power of Projection, HTE discusses when a projector is a better option than a television. If you only plan on watching at night, an outdoor theater might be a better solution. The growing demand for integrated outdoor lighting led to the creation of Hamptons Landscape Lighting (HLL), a division of Home Technology Experts. Through the use of illumination, our HLL team can expand your home beyond your walls. Landscape lighting adds safety and ambiance to outdoor spaces allowing you to fully enjoy these areas at night. Our experienced HLL team members, create designs that highlight an area’s natural flow, using various color temperatures to “paint” the landscape in a way which provides character. HLL’s attention to detail and use of specialized fixtures allow for ideal illumination of landscapes, outdoor sitting areas, pools, decks, docks and more. Exterior shades and motorized awnings are the perfect way to add versatility to any outdoor space. There is no need to decide if you want to screen in a covered area or not, with exterior shades you can have the best of both worlds. Electronically raise the shades to take in the sun or create additional space for parties. At night when the bugs come out, lower the shades and protect yourself from mosquitos while still enjoying the summer weather. For open patios and outdoor kitchens motorized awnings create instant shade when the sun is too strong. Motorized awnings can keep you comfortable, protecting against sun and light rain. When the awning is no longer needed, simply retract it. Create Shade: The sun moves throughout the day, an area that may be plagued by the sunshine in the afternoon may sit in the shade during the early morning. Motorized shades and awnings allow for easy shade control at the touch of a button. Schedule Activity: Like interior shades, exterior shades and awnings can be programmed to raise and lower throughout the day. In fact, if you have a Control4 or Savant home automation system you have the option to create and edit these schedules yourself. Create Privacy: Want additional privacy? Just lower the shades. Save & Protect: According to Somfy using exterior shades can translate into HVAC savings of 25-40%. The shades also protect outdoor furniture and fabrics from getting faded by the sun’s harsh rays. Connect your pool and spas to your home automation system to easily control all of the functions from one spot. You can schedule your filter to run during off hours, turn your heater on as you leave Manhattan so the water is the perfect temperature when you arrive, you can even adjust pool lighting and water features. 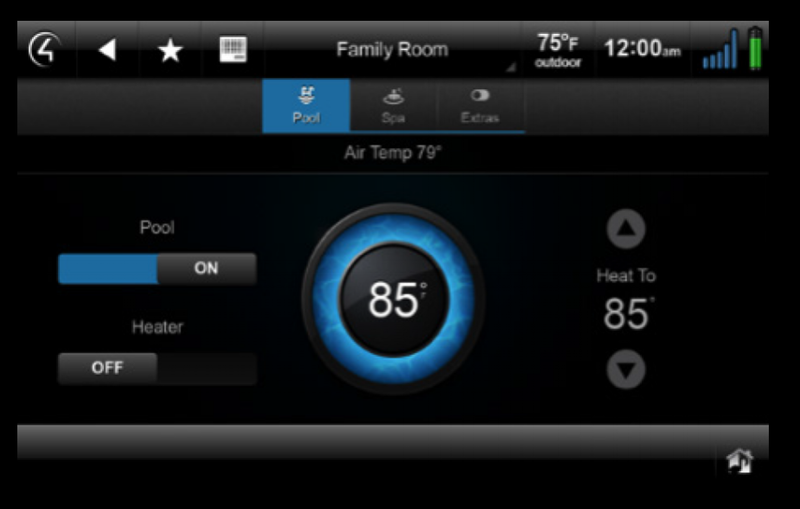 In depth pool and spa control options are included in both Control4 and Savant software. Independently control the temperature and filtration of your pool and hot tub or activate features such as lights, waterfalls, and fountains. With Apple Watch integration, you can adjust setting while actually being in the pool. At Home Technology Experts, we work with the best brands in pool control to seamlessly integrate their full functionality into existing home automation systems. Don’t be tethered to your house this summer. Using products rated for outdoor use, HTE can extend your Wi-Fi and communication capabilities throughout your yard. Connect to your wireless network poolside and use outdoor phones to ensure you never miss a call. Increase your wireless network and enjoy your technology anywhere on your property. With outdoor Wi-Fi boosters, we can enhance your signal extending it to your property’s perimeter. Since exterior boosters connect to your current network equipment, they are a quick and affordable addition that come in useful, especially when entertaining. The Hamptons are notorious for poor cell reception. Inside the home, HTE can add cell boosters to provide a better connection, unfortunately, they are not rated for outdoor use. However, you can leave your cell inside where it has reception and forward calls to a rugged DECT phone, so you can enjoy yourself outside without fear of missing a call.